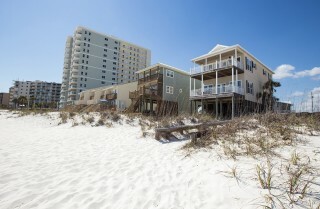 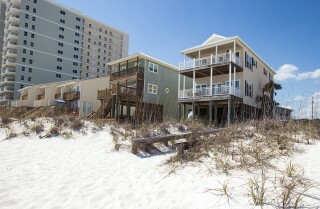 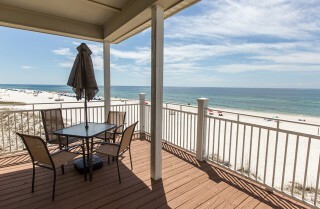 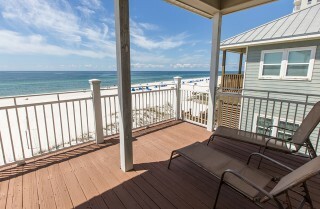 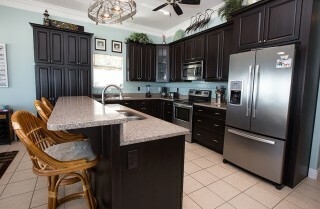 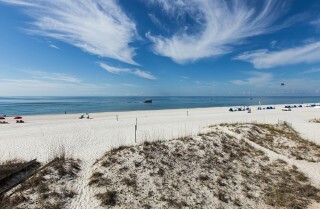 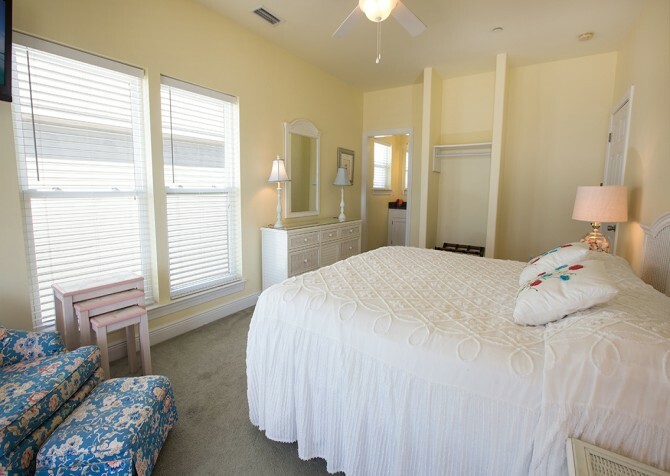 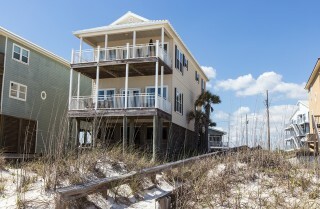 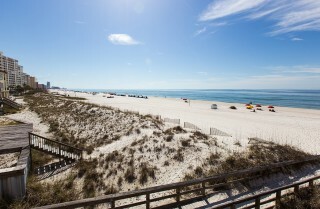 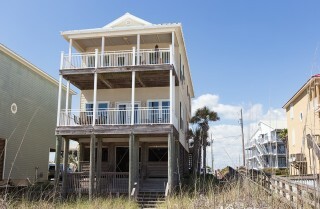 Built in 2010, this beautiful beach cottage boasts unobstructed views of the gulf in Orange Beach, Alabama! 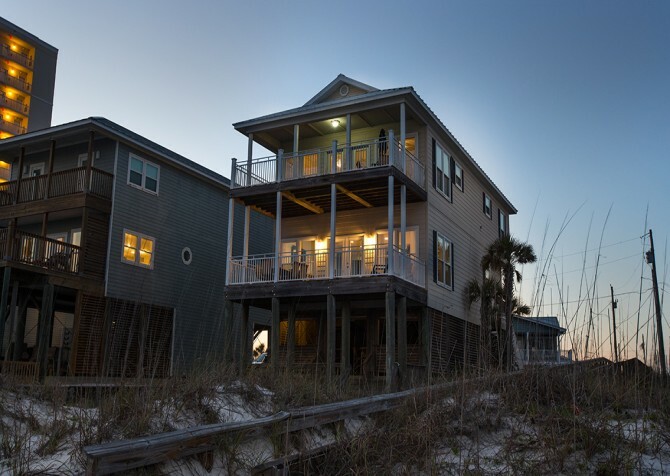 Spend days at waters’ edge, relaxing on the 12-foot covered deck, sipping drinks from your own tiki bar with water views, sticking your toes in the sand just steps from your Orange Beach rental, or prepping fresh seafood dinners at your own fish-cleaning station. 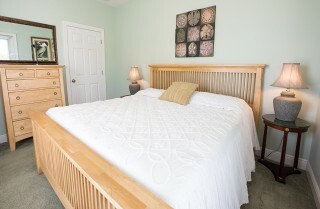 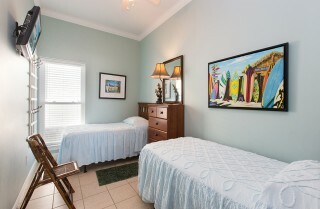 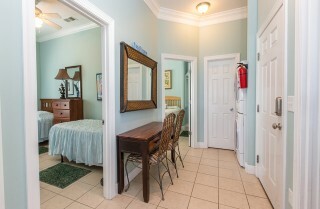 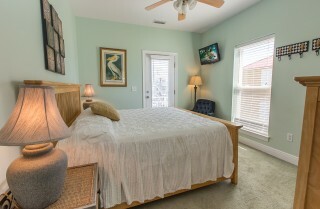 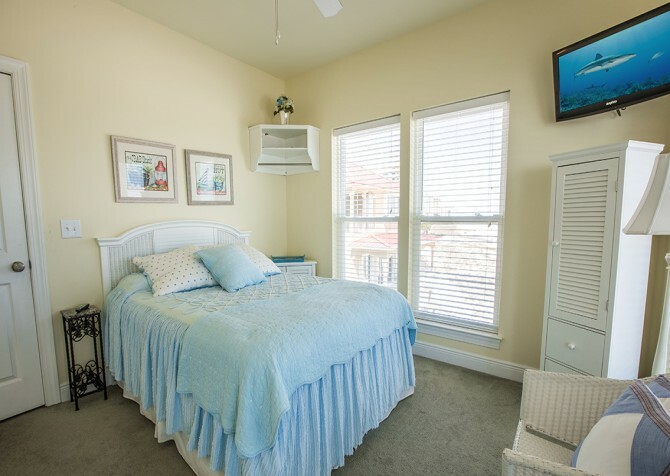 With modern amenities, simple yet elegant island style, and an unbeatable location and views, this Orange Beach house rental is the place to call home when you’re away. The Beach House was designed with living your best beach life in mind. With a gulf-front location, you’ll be steps from the sandy shore – meaning no busy roads to cross with the kids in tow and easy access to fun whenever you want. Spend days building sandcastles, splashing and swimming in the water, and soaking up plenty of sand while easily taking quick breaks for sunscreen, snacks, and cooling off. Love the beach but don’t love sand in your shoes? 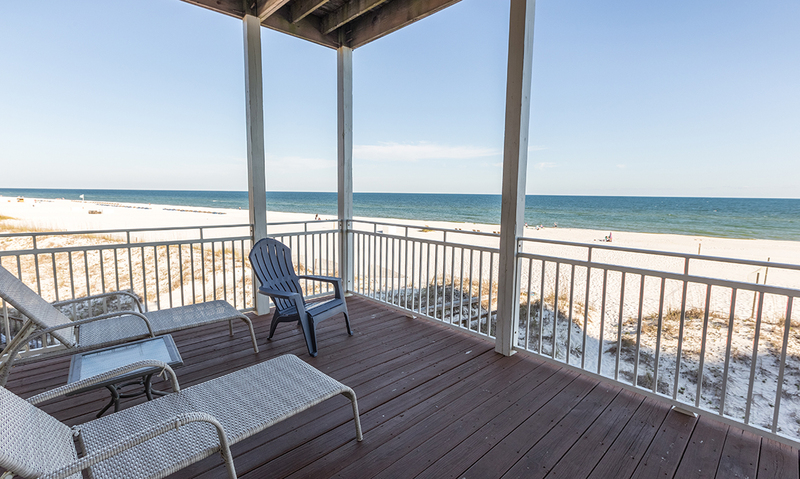 Enjoy it all from the comfort of your 12-foot covered decks overlooking the water. Grab your coffee in the morning and enjoy it while watching the waves roll in or break open the book you’ve been aching to finish and lie back in a lounge chair as you enjoy the warm gulf breezes. 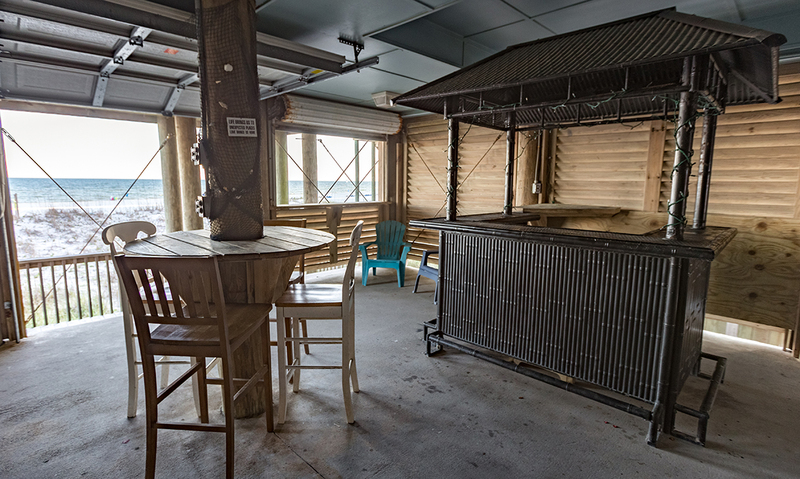 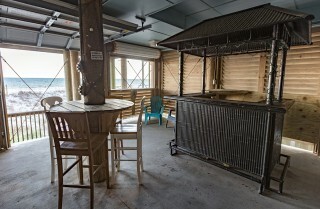 You’ll even have a fish-cleaning station to prepare your fresh catches and a tiki bar with water views on the beach level! Cool tones mix with warm, rich touches to create a welcoming space with relaxed island style in the living room. 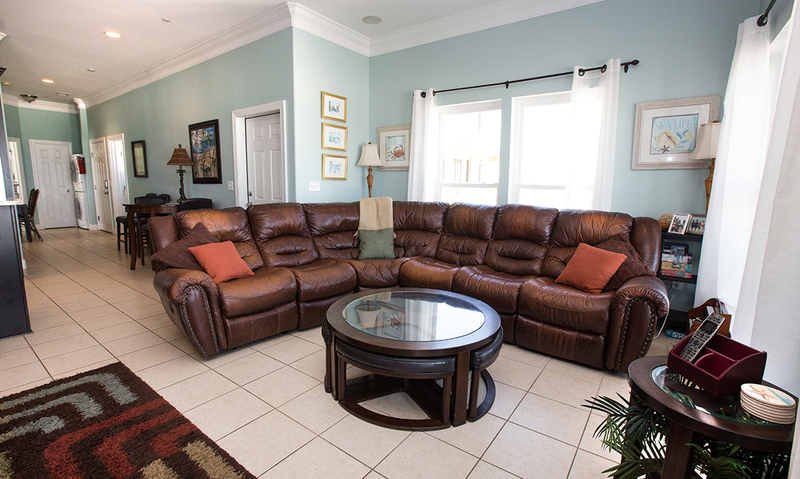 When you need to take a break from the sun, get in a quick nap before dinner, or just want to hang out in the AC for a bit, you’ll find the perfect spot on the plush leather sectional sofa. 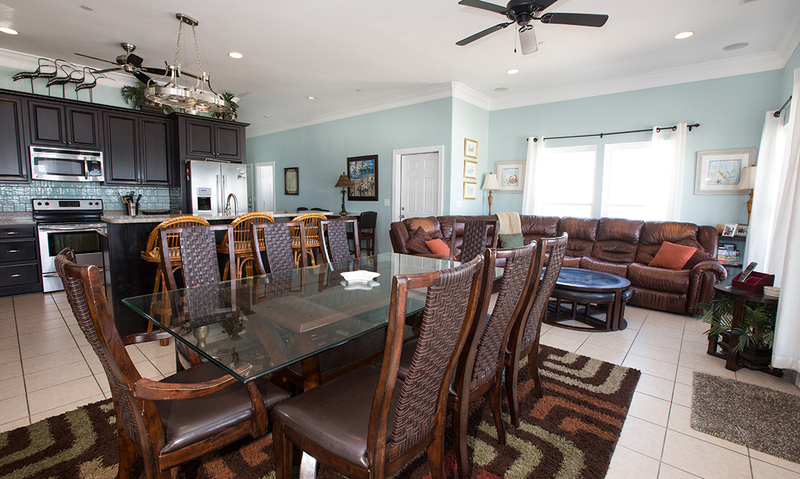 A large round coffee table has space for your snacks and drinks – or a deck of cards – as you hang out and unwind here. 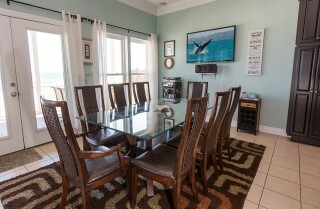 Just flip on the big screen TV, check out the movie library for a DVD, and enjoy! 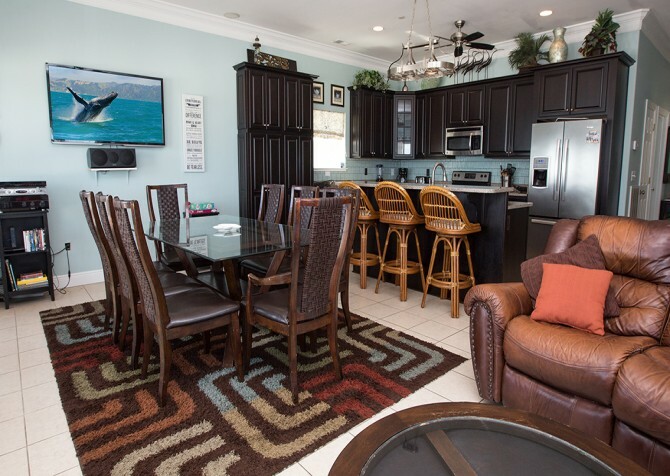 From fresh fruit platters and pastries in the morning to shrimp cocktail appetizers and quick sandwiches for lunch to fresh fish dinners, the fully equipped kitchen at The Beach House gives you the ability to create whatever meals you want when you don’t want to go out. Stock the kitchen with everyone’s favorite snacks and drinks, and between-beach snacks and meals will be a breeze. 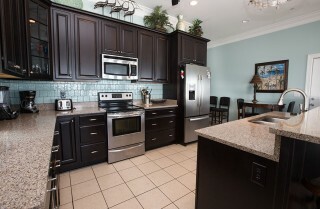 The lovely kitchen features dark wood cabinets, stainless-steel appliances, and a breakfast bar where you can enjoy your morning coffee or nightcap before bed. 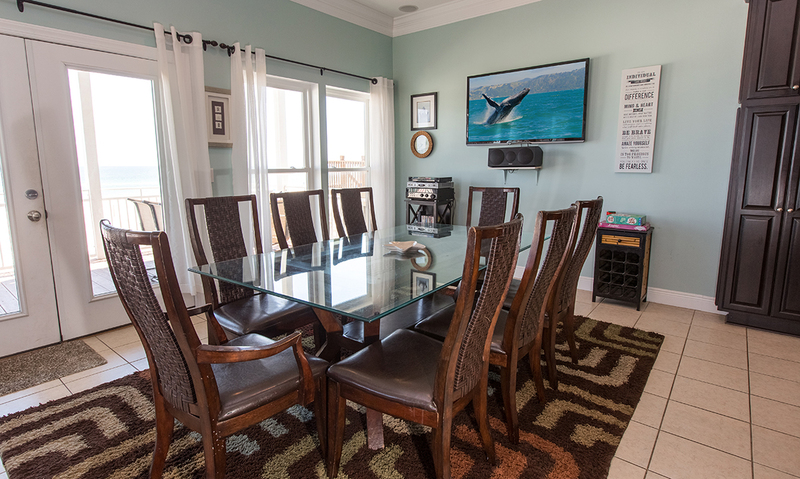 A glass-top table with seating for 8 is a great place to enjoy a group meal or play cards or board games on a rainy day. 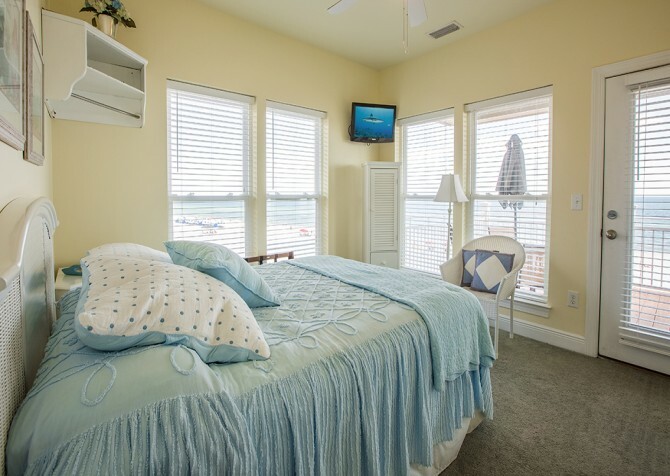 Fresh, beachy colors await in the bedrooms of The Beach House, offering serene spaces when you’re ready to call it a night. 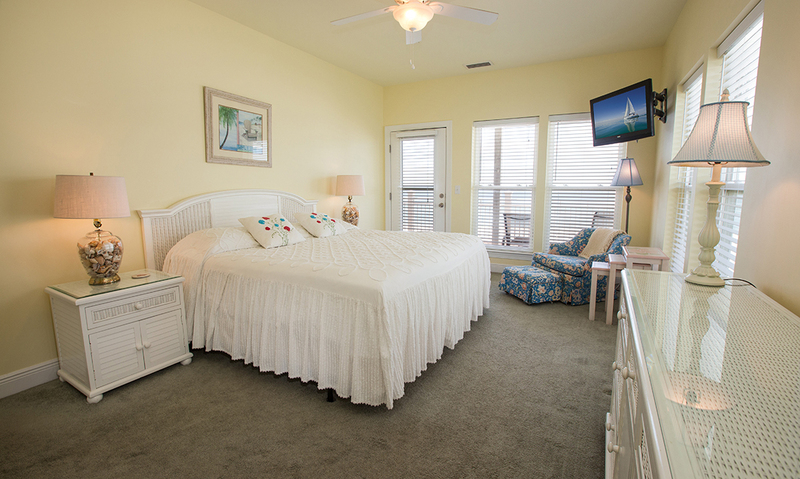 Two of the bedrooms even have direct deck access! 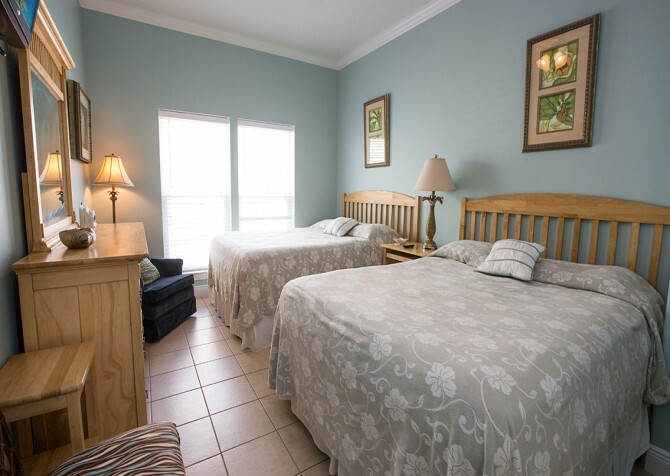 When you’ve had your fill of sun and seafood, retreat to the bedrooms where you’ll find 2 king-size beds, 3 queen-size beds, 2 twins, 1 twin bunk, and 1 twin-over-full bunk. Orange Beach, Alabama, is packed with tons of things to do, from romantic restaurants on the water and boutique shops to go kart tracks and mini-golf courses the kids will love. Souvenir shops, restaurants with everything from pizza to Mexican, and fun family attractions are within a walk or short drive, and a less-than-10-minute drive will get you to the Orange Beach Library, the new ¼-mile State Fishing Pier, and the Senior Citizen Center. A bit father, neighboring towns of Pensacola, Gulf Shores, Foley, and Fairhope offer even more attractions, restaurants, and shops! 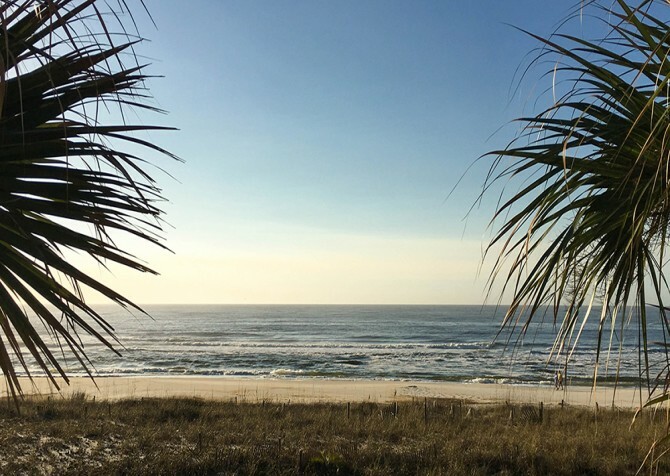 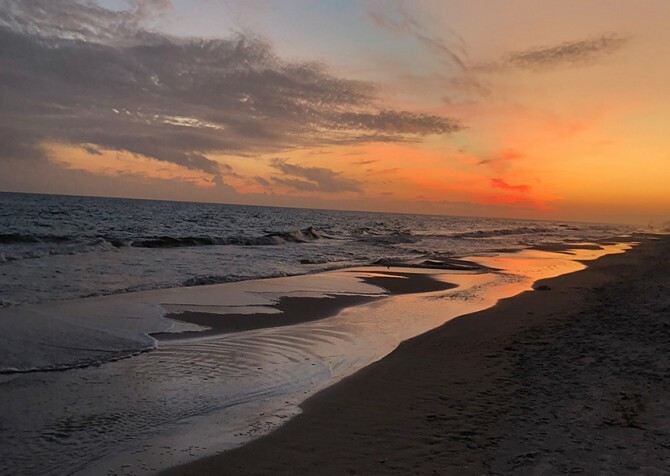 Spend days relaxing in a chair on the beach, kayaking and fishing on the water, exploring the history of the area, playing golf, and so much more in scenic Orange Beach, Alabama! "As advertised, well appointed and comfortable modern home right on the beach and close to lots of shopping and activities. 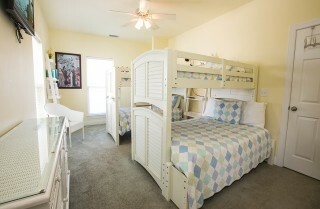 Plenty of room for large groups/families. 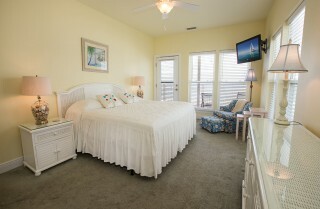 Would stay again."